CAIRO – 24 April 2018: Parliament approved on Monday the government-drafted law that amends some provisions of Law No. 117 of 1983, "Protection of Antiquities Law." "Whoever steals an antiquity or part of such, whether this antiquity is a registered antiquity owned for the purpose of smuggling, shall be punished by imprisonment and by a mulct not less than LE 50,000 and not more than LE 500,000. Except for the mulct penalty, whoever hides an antiquity or part of such for purpose of smuggling shall be punished by imprisonment not exceeding 7 years," according to Article 42 of the Protection of Antiquities Law. The draft Law, therefore, amends the Article 42 to be that whoever steals, possesses, hides and collects an antiquity for the purpose of smuggling or is involved in such act shall be punished with life imprisonment and a fine not less than LE 50,000 ($2,821) and not more than LE 250,000. In the same context, whoever steals a state-owned or registered antiquity or part of such with his acknowledgment of being involved in such act shall be punished with heavy imprisonment and a fine of not less than LE 50,000 and not more than LE 100,000. Additionally, according to Article 45 of the law, whoever intentionally destroys, damages, or spoils an immovable or movable antiquity or separates of such or digs to have an antiquity without license or is involved in such act shall be punished by imprisonment for a period not more than one year and by a mulct of not less than LE 1,000 and not more than LE 50,000. Under the draft law, the following shall be punished with life imprisonment. Under the new amendments, the Supreme Council of Antiquities (SCA) shall remove violations found at archaeological sites and set regulations for the activities on these sites. During the plenary session, Minister of Antiquities Khaled El-Enani said that the amendments include deterrent penalties to fully protect the antiquities in Egypt. The problem of the illicit excavation of archaeological sites in the hope of finding antiquities that can then be sold abroad has been growing in Egypt since the 25 January Revolution. The government has exerted many efforts to combat antiquities smuggling. Minister of Antiquities El-Enani said in a statement in December that 329 ancient coins were seized with an Egyptian passenger at Cairo International Airport while trying to smuggle them to France. 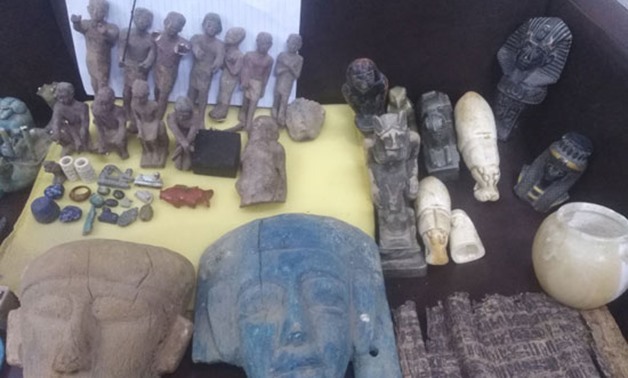 According to police reports in November, the Egyptian Tourism and Antiquities Police managed to seize 464 artifacts, including Ushabtis and statues made of rare blue ceramic, from illegal antiquities merchants in Fayoum. In 2016, Egyptian authorities arrested three men caught on camera peddling portions from one of the Pyramids and selling them to tourists. The criminals seen in the video were arrested and detained for four days on charges of vandalism, trading with antiquities and fraud.